This is how you repair a damaged water pipe and this method can be used with either polycop (the red plastic pipe as per the photo) or copper tubing.Before beginning any DIY project that involves digging or drilling in walls, make sure that you know where to cut the main water flow to your property as there is always a possibility that you might hit a water pipe that you were unaware of. In our case, the builders who installed the water and waste pipe for the one small structure on the property did not take care to bury the pipes at the required depth and the pipes lay only about 10cm underground Therefore, while digging out rain water drainage channels for the property, we accidentally clipped the water pipe and water started pouring out through the damaged section. 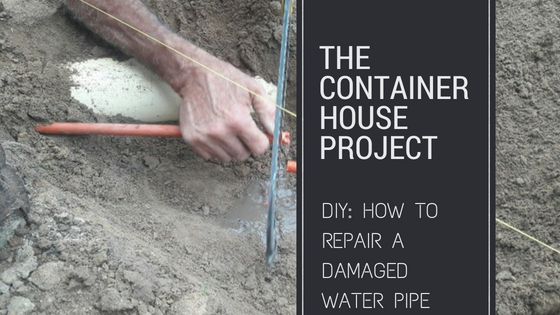 We thought we’d make use of this little accident and type up a DIY on how to repair a damaged water pipe as this is very useful knowledge to have! Switch off the main water supply to the property as soon as possible in order to conserve as much water as possible. As we are in the midst of a water crisis in Cape Town, Gwen held the pipe closed with her hand, as best she could, in order to minimize the wasted water while Louis ran to close the main water tap located by our water meter. Once the water is off, dig out the soil in and around the damaged section of pipe so that you can easily work on it. Cut out the damaged section with a hacksaw. We only needed to cut out about 1cm of pipe. We used a compression straight fitting to join the two ends. (Also known as a “Conex fitting”. Conex is a brand name). It consists of the fitting with two nuts on either with the fitting itself in the middle. A compression ring fits between each nut and the fitting. Push the nut onto the cut end of the pipe, making sure that the threaded side is facing the cut end. Then push on the compression ring. It will be a tight fit. If it is too tight, sand down the pipe with sandpaper as necessary. Fun Fact: The compression ring is also known as a ferrule, or (my favourite) an olive! Place the nut and compression ring on the other side of the cut pipe. As you can see, the compression ring/ferrule/olive fits nicely inside the nut. Connect the straight compression fitting. Our compression fitting has a ball valve built into the unit, which you open and close with a screw driver. For this setting (below the ground), the valve is not necessary. You will often find this type of compression fitting on the side of toilet cisterns as it can be useful to shut off the water to a toilet when working on the unit. We used this fitting because we had it spare. As we are now out in the country, it would have been difficult and unnecessary for us to drive into town to find somewhere open on a Saturday afternoon in order to buy one without a ball valve. Before fitting, we ensured that it was in the open position. If it is fully open, you can see straight through it to the other side. Tighten with spanners, rotating the nuts in opposite directions. Switch the main water supply back on and check for leaks. If there are no leaks you can cover up the pipe. And that is how you repair a damaged water pipe. How fortunate that you not only had the necessary equipment to hand but knew what to do with it! Well done for your swift intervention to stop a whole lot of water being wasted. I suppose the moral of the story is that “a stitch in time saves nine”, as we learned in our Grade 5 lesson on proverbs. Put the pipes at a proper depth in the first place and you’ll save the next occupants having to carry out emergency repairs! I think you are exactly right. Do it right the first time! Let’s hope you never find yourself in a similar situation, but if you do, at least now you’ll know what to do.